In this class, meditations will be guided and brief advice shared on how to maintain a positive, peaceful mind, within the busyness of daily life. Organized by the Odiyana Kadampa Buddhist Center. Tickets are only $10. To purchase, click here. being in your body, a performance by Annie Sailer Dance Company. 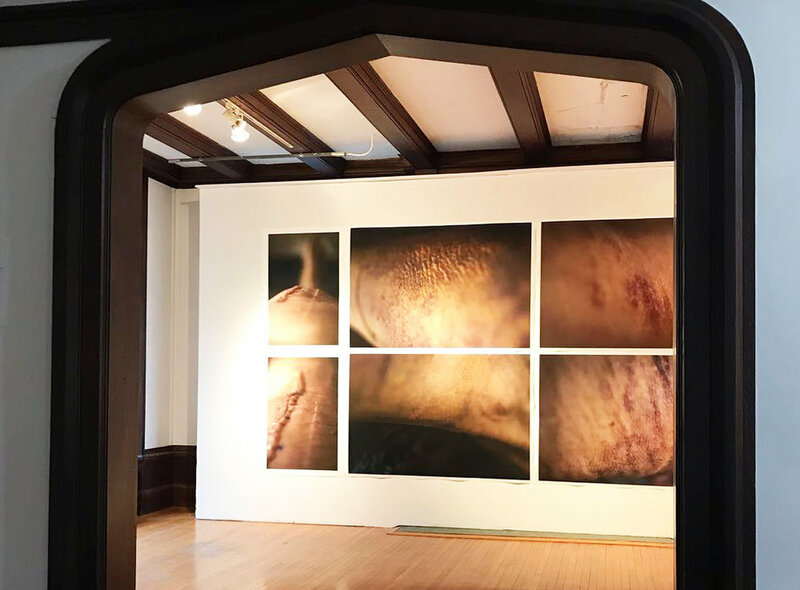 A movement improvisation generated by physical presence, socio-spatial relationships, and our deeper selves; informed by the Ely Center of Contemporary Art space, and art work in the Our Bodies Ourselves exhibition. Explore radical self care through the kitchen as the heart and refuge in the home! Kitchen Wellness Wednesdays are all about participatory self care, spirituality, and nurturing through experiential relationships with food. Annie Sailer Dance Company will be performing during this event, 6-7 pm. More info here. Join Dr. Nash and Dr. Nayak, founders of Feminology, as they explore the hidden costs of "hormonal" contraceptives on the biochemical, nutritional and mental/emotional levels. They will also discuss the many natural ways of balancing hormones and why a healthy menstrual cycle is essential to a woman's overall health. Meet some of the participating artists and exhibition organizers for an informal walk through of the 9 galleries of multimedia artwork in Our Bodies Ourselves. We will discuss the artwork on display and the ideas behind the exhibition. Please join us for a special viewing of Period. End of Sentence. and presentation by executive producer Sophie Ascheim, a Yale University First Year and co-founder of The Pad Project, a nonprofit that raises money for machines that help make pads. The machines are then donated to women in impoverished areas since many women in global, rural communities stop going to school when they first get their period. From the award-winning director Rayka Zehtabchi and a hardworking group of students, parents, and teachers from a small high school in Los Angeles, California comes Period. End of Sentence. a film that follows girls and women in Hapur, India and their experience with the installation of a pad machine in their village. To see recent improvisational work performed by ANNIE SAILER DANCE COMPANY, go to Youtube anniesailer 1, and view videos titled: “documenting sadness”, “forever and a day”, “bluebells cockleshells”, and “ fairytale improvisation”. We invite all artists, activists, and culture producers to come together in celebration of self expression and individuality. This night will highlight resilience and resistance among today's local artists. With performances by Soap, local jazz funk band, Rachel Schmidt, local singer and human rights activist, and local actress, writer, and director Kelley Knight. With poems by feminist activist Mariana Palaez, published author and slam poet Lip Manegio, and featured DJ, artist, and creator Zoe Jensen. Doors open at 6:00 pm — all are welcome to come enjoy the current exhibition, Our Bodies Ourselves. The show begins at 6:45 pm. Play with food, eat, drink healing tea, make potions, engage with hand yoga, reiki, affirmations, meditations, tapping, acupressure, aromatherapy, kitchen table talk, fellowship and other self care strategies to nourish our bodies, ourselves. Meet some of the participating artists and exhibition organizers for an informal walk through the 9 galleries of multimedia artwork in Our Bodies Ourselves. We will discuss the artwork on display and the ideas behind the exhibition. Derek Piotr presents a live performance showcasing his forthcoming work Avia, a sonic meditation on loss and permanence. Avia was inspired by the loss of the artist's grandmother, and diffuses chamber instruments (violin, organ, harp, piano, viol da gamba, etc) with recordings of the artists grandmother to fragile, poignant effect. In this casual skill share we will discuss the history of zines, self publishing, and book arts. Participants will learn to make, design, and publish their own mini zine (also called a one-pager). We will use simple materials to collage, draw, and write our own publications. Participants will also have fun creating their own press names and logos. ALL AGES and EXPERIENCES WELCOME! Opening Reception for our special unjuried exhibition Our Bodies Ourselves. Baked goods donated by Katalina’s Bakery. That Dana Game will DJ live. Plus free parking on Sundays! Please join us for a special reception featuring multimedia artist Adam Malec, who will discuss his intricate tape collage artwork. An auction of Adam's artwork will also be held, benefiting the Ely Center of Contemporary Art. This event is free and open to the public. Plus free street parking on Sundays! A special event with the Yale-China Association, Lunarfest is a celebration of the Lunar New Year and Chinese culture. The Ely Center of Contemporary Art will be open for this special event - explore our latest exhibit, Ear to the ground and a special pop-up exhibit by Yale-China Arts Fellow Nicole Pun from Hong Kong. The Ely Center of Contemporary Art is holding an opening reception for Ear to the ground on Sunday, January 13, from 1 to 3 pm. This show features 73 artists selected by special guest Julie Torres from the Open Call 2018-19 submissions. It runs from January 13 to February 21. Please consider a small donation (or large) to let us know how we are doing. The Ely Center of Contemporary Art is holding an opening reception for A Wintry Mix: A Medley of Exhibitions and Special Projects on Sunday, December 2nd, from 1 to 3 pm. This show features five concurrent exhibitions from various artists and runs from December 2, 2018 to January 6, 2019. Join the Ely Center of Contemporary Art for the #UNLOAD: Pick Up the Pieces closing reception on Sunday, November 11, from 1-3 PM. Join us for a doctor panel featuring Dr. Brendan Campbell, Medical Director, Pediatric Trauma, Associate Professor of Surgery, Connecticut Children's Medical Center, Hartford, Dr. David Shapiro, Chief of Surgery Critical Care, Vice Chairman Surgery Service Line, Interim Chief Quality Office, Saint Francis Hospital, Hartford, and Dr. Kimberly Davis, Professor of Surgery (Trauma), Chief of the Division of General Surgery, Trauma, and Surgical Critical Care, Surgery, Vice Chairman, Clinical Affairs, Department of Surgery, Trauma Medical Director, Yale-New Haven Hospital. They will discuss their experiences treating gunshot victims and community based interventions that decrease the consequences of gun violence. Also covered will be the Hartford gun buyback program. The Center for Contemporary Printmaking is hosting a printmaking workshop at the Ely Center on November 4 from 1-3 PM. Use vintage letter type fonts to print your own protest posters on paper, tote bags, or t-shirts! Supplies will be provided. This workshop is free and open to the public. Terrance Regan of Stone Jaw and Derek Piotr will perform their unique sounds on Halloween night, 5:30-7:30 pm. Derek will perform his new sound piece Grunt. Food, candy, and drinks will be provided. Come and show off your best Halloween costume!